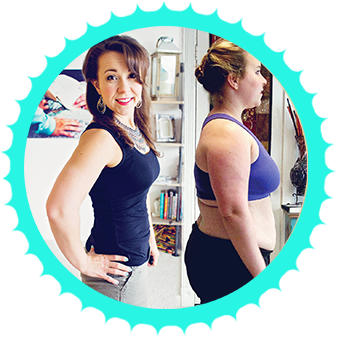 For this interview, get to know about Melissa’s hCG success story and her amazing strategies for continued weight loss! Melissa is awesome. She lost a LOT of weight in a short span of time, but more importantly than that, she went DIRECTLY into weight lifting and pursuing fitness to not only cement her new body, but to actually continue to shape it, now that she is of a healthy size, in a slower more sustainable timeline. This means that she has not only been maintaining her weight loss since November, she’s actually continued to lose, but not through just eating less calories, rather through strategic nutrition and weight lifting. So let’s dig into Melissa’s story! Previous health conditions: Diagnosed with fibromyalgia in late teens, at one point was on 10-12 different medications to manage. All in all she lost about 66 lbs while actually on hCG and over 20 lbs during her 2 phase 3 periods and another 30 lbs on her own through nutrition (which she got a macro breakdown to shoot for from a nutritionist tailored to her, and religiously tracks what she eat as in MyFitnesspal). 126.5 lbs lean body mass (LBM) – this is everything that isn’t fat. You can find my current recommendations for purchasing hCG shots online here. A few shots of Melissa’s muscle gaining results so far! Additionally, Melissa has a fair amount of excess skin she is hoping to be able to remove at some point. Round 1: She followed strict Simeon’s protocol with the 500 calories. Round 2: She followed Lipman’s protocol and ate 700 calories and Lipman’s protocol which includes things like small cheeses and such. Notice that in both rounds she lost basically the same amount of weight in the same amount of time, despite the slightly different caloric intake and food choices. She used homeopathic drops for both of these rounds as well. Initially when she still had a fairly large amount of weight to lose after her first round of hCG, she took up Aqua-Zumba – this was light enough for her joints to handle. After her 2nd round she felt good enough to start the weight lifting and now lifts 6 days a week. This is something she does because she loves it and has goals to pursue competing in fitness competitions. First several days of Phase 3 she added 100 calories every 2 days. Worked up to 1000 calories – please note at 1000 calories per days, Melissa lost 10 lbs in 3 weeks on phase 3- this was not a maintenance level of calories for her. Additionally she was exercising in P3- first with the Aqua Zumba after her first round, then with the weight lifting and some gym cardio after round 2. Regarding WHAT she ate, she said mostly vegetables and lean protein- like chicken breast, pork loin, turkey breast etc. and that she DID actually incorporate a small amount of complex carbs in the form of sprouted grain breads like Ezekiel bread. Her calories were kept low and it appears this worked perfectly fine for her. She says she had a bad reaction ground beef so was not eating that. So where did this all lead? We all want to see this lady get to eat more than 1000 calories right?? Melissa is taking this weight lifting life pretty seriously- and not surprising as her mom was a female body builder! So in her bulking phase, she eats 1900-2000 calories per day. In her leaning out phase her calories are just a little less, around 1700. Her macro ratios change depending on whether bulking or leaning aka “cutting”. Melissa dealt with Bulimia in the past which began in high school. She said she would lose 20-30 lbs purging, but of course gain it right back. In asking her how she moved past this eating disorder she says she feels with this sort of thing you are never fully free of it in the sense that you still occasionally think to yourself, “I could throw this up” but you learn to refocus your energy and attention on something more positive and healthy (like weight lifting!) and make that choice to do the right thing for your body, not the wrong thing. I resonated with her when she said she has an addictive personality and needs to fully DO and immerse herself in whatever she is pursuing- for people like us, replacing bad addictions with positive, healthy ones that put us in a better place, seems to be an approach that works well long term. I too am this way. She made major use of the YouTube hCG blogging community, which is still alive and active- it’s just new/different people – she feels this support she got by vlogging, watching other’s vlogs, and the communication back and forth was very important to the success of each of her rounds. Once you find a few vlogs of people who have made videos more recently, scroll through their comment feed and subscribe to those commenting on their vlogs – they are likely current hCGers as well. Lastly, something that was close to her heart that she specifically brought up and wished to speak on in our interview is using hCG only as a tool, and not relying on it forever where it becomes a crutch. I can’t get into all of it here, but she has some good things to say in our interview if you give it a watch/listen. – Slice sweet potatoes or beet chips very thinly and toss with coconut oil. You can use cinnamon to make them sweet, or other spices to make them savory. – Place spread out on a baking sheet, on the low rack, at 375 degree oven. She iterated to let the oven get nice and hot for about 10-12 minutes before putting them in. I also liked this little tip because my son is sensitive to sugar also, but she says she has found Beet juice they make with their juicer to be very sweet and great for “sweetening” her son’s meals. Halo Top Ice cream – a low sugar ice cream option that’s amazingly yummy – has erythritol and milk protein and a much smaller amount of sugar than regular ice-cream. hCG Diet Interviews - Episode 6 - 127lb Weight Loss with the hCG Diet: Maintaining for 1 Year Now! Hello! I didn’t see any information about what homeopathic drops she used. Can you please provide the name of them or a link to their site? Thank you!! I thought you can’t lose weight on P3? Can someone clarify if aiming to lose weight on P3 is acceptable? Can I work out while I do the P3 diet? This is a breath of new encouragement…I want to restart my HCG journey but for some reason I keep putting it off. My current excuse is I travel for work so I don’t eat while I work. I munch on a piece of bread or drink juice in the morning at 7am with my vitamins then wait to get home at 6pm to have dinner. Anyone have any suggestions for me? I don’t see Michelle’s blog or instagram name in the show notes. Thanks! I’ve added the links now. Reading her story this morning was like a gift from the universe showing me that it can be done once again! I’m so grateful that I subscribed to get these motivating messages and videos.